First of all I would like to wish each and everyone of you a very happy new year and our best wishes for 2016! I am pleased to be sending you the January edition of the IRF Newsletter. 2015 was a busy and productive year for IRF, and I trust for all of you it was equally productive and successful. I would like to share with you some highlights from the past year and our plans for the coming year. We started 2015 by celebrating the Indian road safety week in New Delhi with a number of events and activities. During the course of 2015 we organized several important events in Africa, China, India, Brazil and Australia. These events included – among others - the launch of the IRF Road Safety Challenge for Africa in Addis Ababa, Ethiopia, the organization of the Third African Road Safety Conference together with the African Union, the United Nations Economic Commission for Africa, the The Global Road Safety Partnership, and the Sub-Saharan Africa Transport Policy Program of the World Bank, the China Congress and annual meeting in Chongqing, China together with the China Highway Transport Society (CHTS) and the Transport Planning and Research Institute (TPRI), a regional conference organized together with Roads Australia in Sydney, Australia, a side event on Safe Infrastructure for All Users during the 2nd High Level Conference on Road Safety in Brasilia, Brazil together with the International Financial Institutions (World Bank, the European Investment Bank, the Inter American Development Bank, Islamic Development Bank, and Banco DeSarrollo de America Latina) and the United Nations Environmental Program (UNEP). IRF Geneva, together with the Multi-lateral Development Banks (MDBs), and the United Nations Environmental Program (UNEP) organised a side event "Safe Infrastructure for All Users" during the Road Safety Ministerial in Brazil. Nitin Gadkari, Union Minister of Transport of India presided over a very well attended side event. Discover and discuss the latest trends in road design, sustainable rural road network development, ITS to improve traffic management, tolling, financing alternatives, asset management for road networks and performance. Intertraffic and IRF Geneva collaboration goes back a long way. The two entities have over the years successfully collaborated to develop productive and mutually-beneficial synergies. 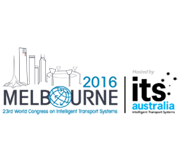 IRF Geneva will take the opportunity of this flagship event to convene its members for a GA and Board meeting. 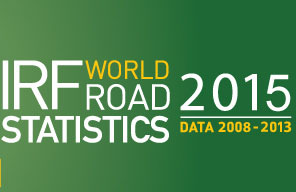 The 2015 edition of the IRF World Road Statistics is out! 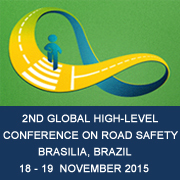 Every year since 1964 the International Road Federation (IRF) publishes the World Road Statistics (WRS). The WRS are a unique and authoritative set of raw data compiled from over 200 primary sources (i.e. national statistics offices and Ministries) around the globe. The 2015 edition is now available. 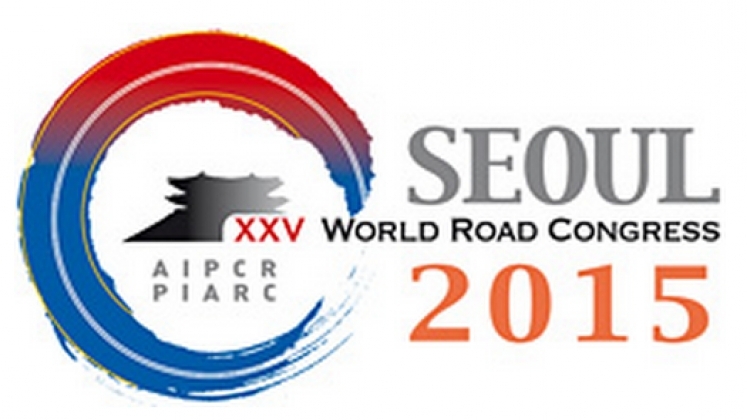 IRF Geneva gives keynote address at 26th World Congress of Traffic Medicine in Doha. Dr Rahman gave the keynote address at the 26th World Congress of Traffic Medicine in Doha. He pointed out that at 2015, the midpoint of the Decade of Action for Road Safety, the situation with regards to the quality and availability of road related data and information remains worrisome, enforcement of traffic rules and laws remain weak. The 8th session of the Group of Experts on Climate Change impacts and adaptation was organised by the United Nations Economic Commission for Europe (UNECE) in Geneva on 14 and 15 January 2016. IRF was represented by Ms. Mui-Ling Wang, Director Working Groups and Roundtables. Dr Rahman , IRF Geneva Director General discussed the role of ITS in improving the management and planning of road networks, in data collection, for developing evidence based interventions, speed management and better trauma care through timely care to accident victims during the golden hour. Kiran K. Kapila, Chairman, IRF Geneva and Mr. Jean-Francois Corte, Secretary General, PIARC held discussions for various possible collaboration and cooperation in the areas of green road developments and road safety in the global context. 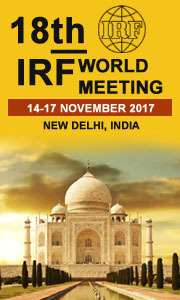 The two major professional world bodies agreed to work together for the success of the 18th World Road Meeting (IRF) to be held in New Delhi, India in 2017. 1. Guidelines and/or regulations used in other countries for the development of these areas. 2. Information on interchanges that have been developed in confined areas (location, type, size, access, land uses, etc.). Susanna Zammataro, IRF Executive Director is back this week from maternity leave. Little Zelda was born on 23 August. Not yet an IRF Member ? Join the IRF today! Take advantage of a whole range of services including special rates for the IRF World Road Statistics (2015), other IRF publications and preferential registration rates for upcoming IRF events! Join us, and become part of the IRF family! 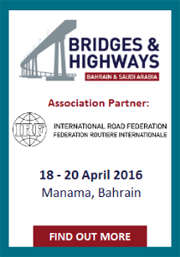 © Copyright International Road Federation 2016. All rights reserved.